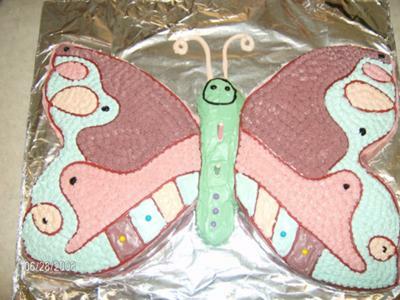 To make this butterfly cake, I used 2 cake mixes and 2 9x13 inch cake pans, I freehanded the wings & the body consisted of 2 twinkies. The detail was outlined with twizzlers pull & peel. I used several things of cream cheese icing which I put food coloring in to make various colors!!! I made it for my grandaughter's 2nd birthday! I love the fact that you did the wings different than most butterflies. Your cake was so nice and I loved your colors. It was very beautiful. You did a good clean job. Be Proud..